Daring Cooks August 2010 - Pierogi - Wots For Lunch? I used the challenge as an excuse to buy myself a new toy from Yuppie Chef, one I’ve been lusting after for awhile now. A Joseph Joseph adjustable rolling pin, what an improvement from the old Spray and Cook can I’ve been using up until now! I opted for the Russian style pierogi dough as it seemed a little simpler and had a shorter list of ingredients. 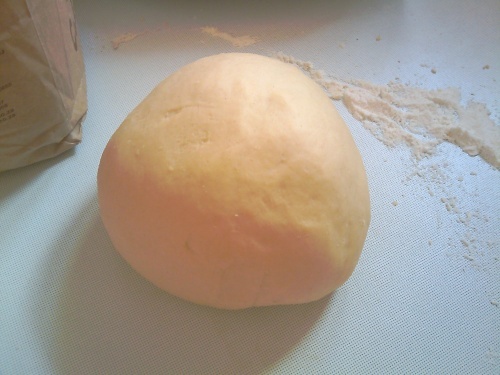 The dough was fairly easy to make and after a little kneading came together into a satisfying golden orb. 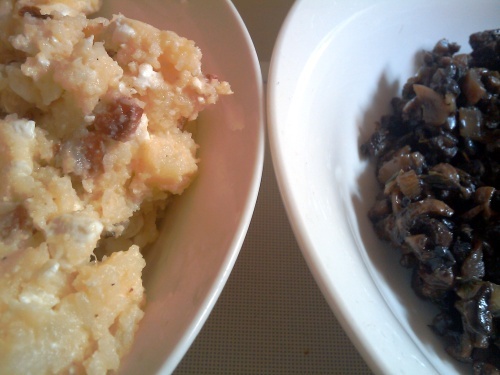 I prepared two fillings, the first of which was the Russian style potato filling supplied with the challenge. I substituted the bacon with finely diced chorizo for a different flavour. For the second filling I sautéed onion, garlic, mushrooms and some thyme in a little butter until all liquid from the mushrooms had evaporated and the mixture was deliciously fragrant. Next came the rolling and filling stage, this is the part where my new toy really shined. The final result was a small army of delicately scalloped dumplings patiently waiting to be cooked. The reward for my efforts? 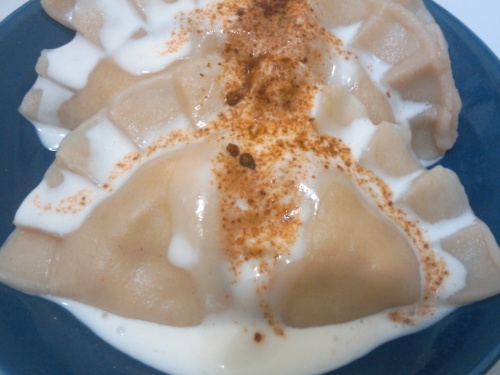 A plateful of boiled pierogi topped with a little sour cream and a dusting of smoked paprika. Another fun challenge this month, now if only I could get into the habit of not waiting till the very last minute to perpare my entry. All recipes for this month’s challenge can be found here. This entry was posted in Daring Cooks and tagged chorizo, dumpling, mushroom, onion, pierogi, potato, thyme. Bookmark the permalink. Beautiful looking pierogies! I’m assuming you pleated them by hand – must’ve took ages. Looks like the result was well worth it though – the added chorizo sounds fantastic. 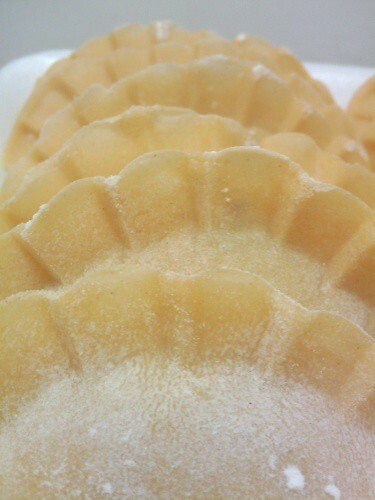 PS: Love the photo of the uncooked dumplings – sp pretty! Thanks Marisa, I used one of those pierogi/gyoza forms to seal them. Couldn’t get the pleating by hand right. THAT is spectacular – drool factor, photos and recipe!!! Well done, I am inspired to try!!! nina´s last blog post ..Thai Event – The Winners!! Wow, thank you so much Nina. Coming from you this is an amazing compliment. Thank you for taking part this month! My first time making pierogi, but I’ll definitely be making them again. Thanks for hosting this month’s event. there are few things that make me happier than cute little dumplings, and these look divine! time for me to join the daring cooks, methinks? well done you!